A comparison between the Paris boulevard Avenue des Champs-Élysées and Bluffton’s Calhoun Street seems rather far-fetched. Not so fast. While Paris’s retail mecca is crisp and sparkling, with designers occupying the storefronts hailing from Milan, Paris, London and New York, Bluffton is a bit more, shall we say, casual… thankfully. Snuggled at the heart of Calhoun Street’s galleries, shops, and restaurants is Gigi’s, a darling boutique with enough charm, style and chic to rival the boutiques lining La Seine, where sisters Emily Vaux Burden and Anna Pepper Vaux Hewett have thoughtfully curated a fashion and accessories collection perfectly suited to their stylish clientele. Opened in 2008 with an upscale eclectic vibe, Gigi’s certainly hits that mark, and the sisters’ business has steadily grown, drawing on their natural penchant for building personal rapport with their customers. “We are just such a relationship store,” Burden said. “We like the personal contact,” Hewett said. “We like to laugh and work with our customers face-to-face.” Those personal relationships have been vital in helping them cultivate their shop into a place where moms and daughters, aunts, grandmothers, nieces, and friends can find an array of styles: boho chic to classic, and casual to cocktail fashion, along with jewelry, accessories, gifts and shoes. Whether your mom is your most trusted shopping partner or more accurately described as your adversary, or you’re browsing with your girlfriends, boyfriend, husband, or sisters, the staff at Gigi’s is thrilled to assist. With three fulltime team members, four or five part-timers, and a talented merchandiser who joins the team a couple times a month, executing imaginative window displays and consulting on product merchandising, the creative juices are always flowing. Every customer can expect a warm welcome and just the right amount of help to pull it all together. With a large number of lines and styles, the shop is primarily sorted by color and is crafted carefully and deliberately during every buying trip. Going on eight children between them, Hewett and Burden know they could not do what they do without their shop girls. Six of their children attend May River Montessori School, just a short walk down Calhoun Street, where they get involved as much as possible, when not tending to their families and their boutique home. The casual, indie ambiance on Calhoun Street pairs perfectly with Gigi’s Boutique, where the Vaux sisters have created a special destination, combining hand-picked fashion with friendly service beyond compare. 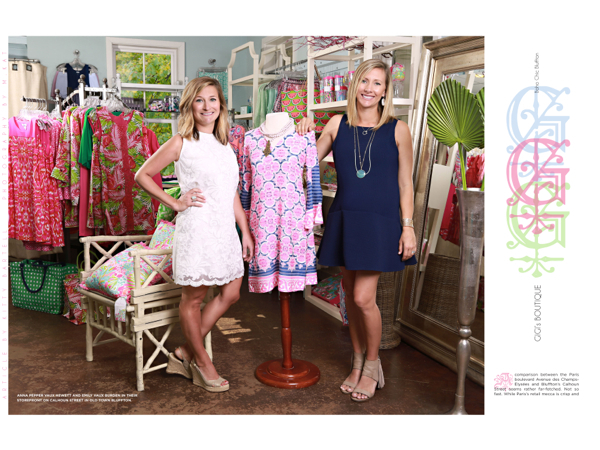 Occasionally posting outfits, unique pieces, and special events on their Facebook page and on Instagram, Gigi’s offers tempting invitations to visit the shop, where Hewett, Burden and their team are always listening to what their customers want and working diligently to make it happen. 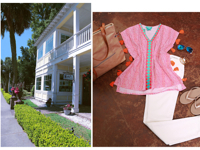 Decidedly charming, stylish, and chic, in the heart of Old Town Bluffton, Gigi’s is the perfect shop where moms and daughters can satisfy their personal style cravings… together. Gigi’s Boutique is located at 40 Calhoun Street, Bluffton. For more information, please call (843) 815-4450 or visit gigisbluffton.com.